For over 70 years, F&S Williams has been plumbing Tippecanoe County. Our expert professional plumbers in Lafayette and surrounding areas are trained and certified in all areas of modern plumbing methods. Environmental factors have become more important to many customers in the last several years and F&S remains a leader in environmentally sound alternatives. From energy-saving tankless water heaters to entire solar water heating systems, F&S has the expertise, the training, and the equipment to make any installation go smoothly. Just call F&S and let us know about your plumbing problems and we will supply you with the professionalism you deserve. 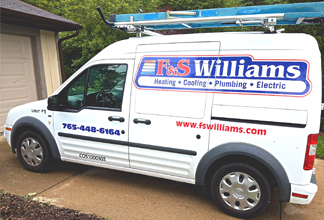 It's a relief that when you have a plumbing emergency in Tippecanoe County or the surrounding area, you can count on F&S Williams to have the knowledge and training that allows a home owner to relax and know they are in good hands. A legacy of plumbing success from F&S Williams! The folks at F&S Williams have helped prevent a lot of floods and eliminated the most stubborn drips over the years. You're gonna say "YES!" to plumbing excellence from F&S Williams! Contact us today!